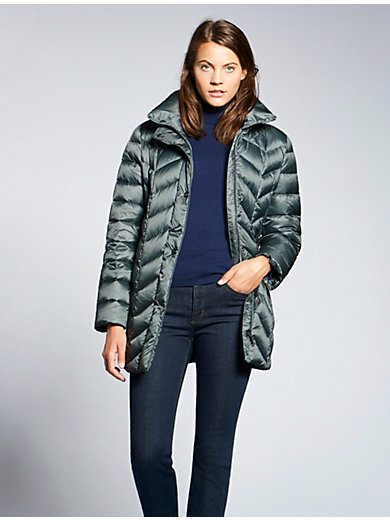 Quilted down jacket by BASLER. Feather-light, as soft as down and wonderfully warm. Top quality, slightly iridescent microfibre with a silky shine in great new colours and with flattering quilting. With high closable, warmly padded stand-up collar, a concealed zip fastener and press stud front, 2 zipped seam pockets and 1 inside pocket with zip fastener. Top quality filling made of 80% down, 20% feathers. Outer fabric and lining made of 100% nylon. Length approx .31ins. The quilted down jacket is machine washable.